by LakeChelanNow, Feature photo by Air Attack taken around 5:00 PM, 8/2/2018. Yesterday, northeast and east winds caused the fire to be very active at the western portion of the fire and it remained active through the night. Firefighters continue to limit fire spread westward toward the communities of Chiwawa Pines, Shugart Flats, and Plain. Fire crews are assessing structures in these communities an in the Entiat Valley. Secondary fire containment lines above the communities are also being prepared. Dozers and other heavy equipment are improving and reinforcing containment south area of the fire. Fire managers continue to monitor and assess the fire in Grandma Creek on the northern perimeter of the fire above the Entiat River. As a contingency measure, structures in the upper Entiat River Valley are being assessed and additional contingency lines are being identified. Smoke continued to be heavy across the fire area on Saturday, decreasing the activity during the daytime and limiting aircraft availability. When aircraft were able to fly they continued to check fire spread in the Grandma Creek area on the Northern side of the fire. Firefighters continued to monitor and mop up south-eastern corner in the Entiat Valley. The western side of the fire was exposed to East and Northeasterly winds, increasing the activity. Overnight firefighters saw a significant increase in fire activity along Miners Ridge on the western side of the fire. Today, additional crews will work on the fire’s southern and western edges, working to contain westerly fire spread and continuing to prepare the area for low intensity burnout operations that will continue when conditions allow. Contingency lines are also being prepared from the fire’s western edge north toward the Lost Fire with mechanical equipment and dozer lines. Crews will continue to mop-up, hold and patrol contained fire edge in the Entiat Valley as well as use aviation to prevent fire growth around Grandma Creek. During operations yesterday, there was a single vehicle accident, involving a water tender rollover on the 6101 road of the Cougar Creek Fire. Incident personnel and emergency responders extracted the driver from the crash site and transported the patient to Confluence Health, Central Washington Hospital. The individual’s family has been notified and he is reported to be awake and in good spirits. Smoke decreased on Friday with winds exceeding 25 mph, pushing the smoke out of the valleys and increasing the fire behavior across the area. The increased fire behavior led to interior sections of the fire area burning more actively, which created the column of smoke that was visible for most of the afternoon. Resources assigned to the incident also supported initial attack in the area following yesterday’s lightning activity. On Saturday, additional crews will work on the fire’s southern edge from the Sugar Loaf Lookout area to Gold Ridge, continuing to prepare the area for low intensity burnout operations that will continue when conditions allow. Contingency lines are also being prepared from the fire’s western edge north toward the Lost Fire with mechanical equipment, chipping, and dozer lines. Crews will continue to mop-up, hold and patrol contained fire edge in the Entiat Valley as well as use aviation to prevent fire growth around Grandma Creek. Increased winds Thursday pushed fire smoke out of Leavenworth and parts of the Entiat River Valley. The winds also aided firefighters who conducted low intensity burnout operations along the southern perimeter from Sugarloaf Lookout to Gold Ridge. Winds will increase Friday with a Red Flag Warning across the fire area. Humidity continues to be critically low. Friday’s focus is to hold the containment lines in the Entiat River Valley and reinforce protection on the southern perimeter. Weather permitting, helicopters will assist firefighters on the ground in the Sugarloaf Lookout area where they will work to gain more depth of the containment line; and above Grandma Creek, crews will work to hold fire in the steep and rocky terrain. Weather and Fire Behavior: Friday’s Red Flag Warning continues through midnight. Dry conditions and increased winds could result in rapid rates of spread in lower elevations. Active torching and fire growth are likely on the dead and down trees, with potential crowning on live trees within the fire’s interior. All evacuation levels are being downgraded by 1 level effective 10am today, 8/16/18. Level 1 to nothing = Oklahoma Gulch Rd, Navarre Coulee Rd (97-ALT to South Lakeshore Rd), Johnson Creek Rd and First Creek Rd residents. Also Entiat River Rd from 97A to Crum Canyon. Level 2 down to Level 1 = Entiat River Rd from Mad River Rd down to Crum Canyon Rd and both sides of Crum Canyon Rd. Level 3 down to Level 2 = Mad River Rd & Ardenvoir. Also Entiat River Rd from Mad River Rd to end of Entiat River Rd (approximately MP 25). Be advised that there will be increased patrols by Deputies on the Entiat River Rd from Mad River Rd to the end of Entiat River Rd, enforcing the reduced speed limit of 25 mph. This is due to having fire fighters and equipment on the road. Residents saw helicopters flying the Cougar Creek Fire Wednesday. In Grandma Creek, on the northeast perimeter, the fire was active and the helicopters dropped water, on a hotspot that presented a rollout hazard. In areas around Potato Creek, helicopters dropped fire within the interior of the fire’s perimeter to reinforce a stronger containment line. Along the fire’s southern perimeter, increased temperatures and winds resulted in a two-acre spot fire that firefighters immediately suppressed. Crews worked to contain it through the evening; and today, they expect to have it fully contained. Thursday brings changes in the fire behavior. “This is a look up, look down, and look around day,” says Fire Behavior Analyst Jeff Shelton. The winds are cresting the Cascades, moving smoke out, and allowing heat in. “What flames were creeping yesterday will be chewing today.” There is potential Thursday for spot fires and burning inside of the fire’s perimeter. Residents can expect to see smoke plumes. Firefighters increased containment Tuesday on the Cougar Creek Fire. Firing operations in the Entiat River Valley were expanded Tuesday around the homes and commercial buildings. Tuesday night, crews patrolled and reinforced the line along the fires edge. All efforts Wednesday focus on extending and reinforcing containment lines prior to Wednesday’s predicted winds, with gusts up to 20 mph. Depending on the weather, helicopters could be used to drop fire into areas of unburned vegetation to increase the containment lines. Temperatures are increasing Wednesday. Westerly winds could push smoke off the Cascade Ridge in higher elevations. Clearer skies would allow firefighting helicopters to be used to reinforce containment lines and help with burnout operations. While the goal is to lower evacuation levels as soon as possible, evacuations remain in effect to provide for firefighter and public safety. 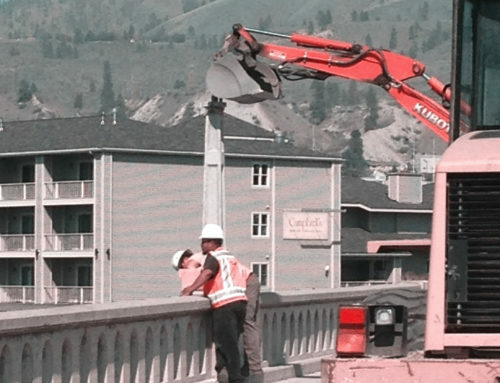 After Wednesday’s predicted wind event, fire managers, local cooperators, and Chelan City Emergency Management personnel will discuss lowing evacuation levels. 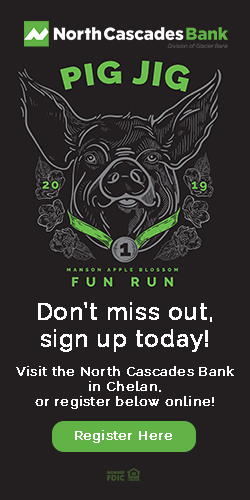 Tuesday, August 14: Chelan Performing Arts Center, 215 Webster Ave., 6:00 p.m. Firefighters continued a direct attack Monday on the Cougar Creek Fire. 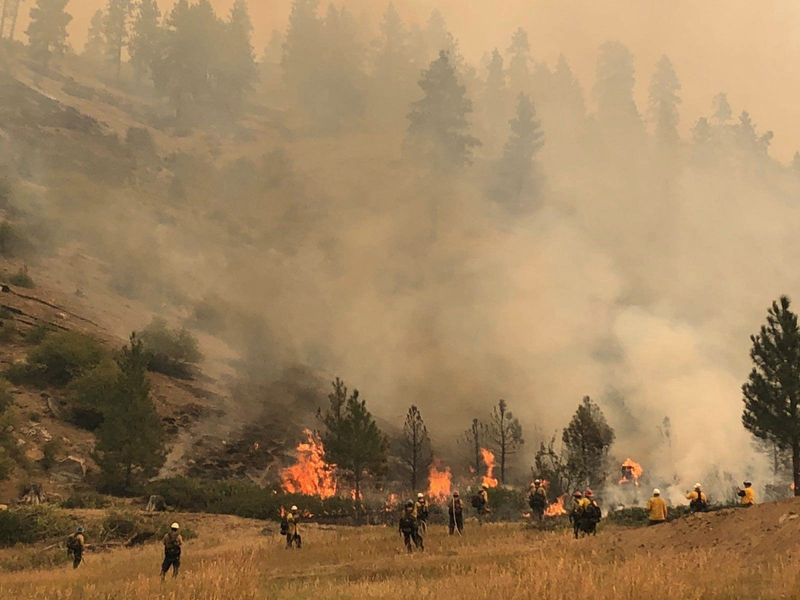 With 300 residential and commercial structures threatened, a structure-protection team stayed on scene along the fire’s eastern edge in Entiat River Valley. No structures have been damaged or destroyed in this fire. “Our crews accomplished a lot Monday and our priority is to hold and secure these areas and keep the fire away from Ardenvoir,” says Deputy Incident Commander Carlton Joseph. Through Monday night, additional crews conducted firing operations to secure line along the southeastern to southwestern perimeter to protect the community of Ardenvoir. No new growth was reported along the northern section of the fire. A firefighter was treated for a rattlesnake bite Monday and is expected to be back on duty Wednesday. Light winds forecast for Tuesday bring another window of opportunity for firefighters to aggressively attack the fire. Tuesday’s priorities include reinforcing the fireline at the Tyee Creek Ridge, continuing structure protection, and completing the fireline around the Entiat River Valley. Along the southern perimeter, crews will proceed with firing operations between Sugarloaf Peak and the Ardenvoir area along the fire’s southern perimeter. This will strengthen containment lines prior to Wednesday’s anticipated winds. Monday, August 13: Entiat Fire Station, 2200 Entiat Way, 6:00 p.m.
Sunday’s firing operations stopped the progression of spot fires within the Entiat River Valley and protected the town of Ardenvoir. “On the heels of an intense two days, our firefighters held the fire lines, and we saved structures,” said Incident Commander Rick Young. Favorable weather conditions Sunday night allowed direct attack on the Cougar Creek Fire. Personnel worked through the night, protecting structures and strengthening fire lines south of Stormy Creek and north of Mud Creek. Residents may see smoke in the valleys Monday with an inversion layer putting a lid over the fire. The stable atmosphere makes Monday a great day to directly engage the fire. Firefighting priorities remain in the Entiat River Valley Monday. Active firing occurs on the east side, south of Tyee Creek, in Stormy Creek, and in Potato Creek. Firing operations are also extending around the southeast tip of the fire toward the west. Dozers will reinforce line around the southern and western perimeter to protect Plain. Fire growth continued yesterday and into the evening as vegetation, winds and topographic features came into alignment. The result was expansion of the fire to the east of Entiat Road. Today these spot fires on the east side of Entiat Road are prioritized and will be addressed by fire resources on the ground as well as the air. Dozer work will be initiated today near Potato Creek road to tie in with the road systems in that area. Windy conditions yesterday grounded aircraft but today they will be able to be utilized. Another priority today will be closing the southeast corner of the fire as firefighters prepare to burn out and secure this area, preventing further spread to the southeast and protecting Ardenvoir. One additional priority will be to come down from the area of Grandma Creek to address the upper eastern portion of the fire. Two hand crews in the area of Grandma Creek have been spiked out and have done a tremendous job preventing further spread of the fire to the north and east and aggressively suppressing the fire directly but safely. No structures have been damaged or destroyed. This is a direct reflection of the excellent work by firefighters and those involved with structure protection groups. Beginning at 8:00 a.m. Sunday morning, Level 1 “fire advisories” are in place for residents on Oklahoma Gulch Road, Navarre Coulee Road (from Hwy 97-ALT to South Lakeshore Rd); Johnson Creek Road and First Creek Road. The additional advisories are a result of a spot fire originating from the Cougar Creek Fire into the Potato Creek drainage. The spot fire occurred Saturday afternoon and is burning to the northeast. Residents in the mentioned areas are asked to monitor fire information and be “ready” to evacuate as conditions change. Cougar Creek Fire Public Information Officer, Nick Mickle, indicated this is precautionary and Chelan is not threatened. 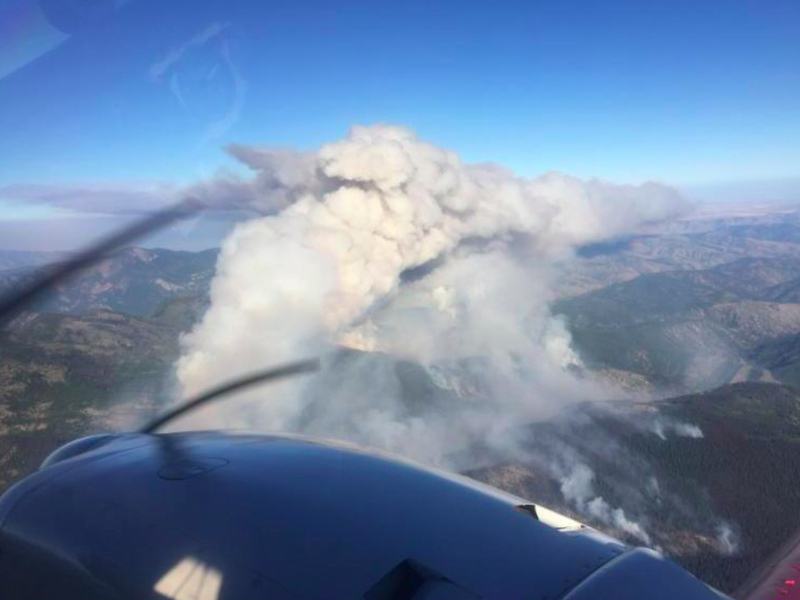 Mickel confirmed that water scooping planes have been requested and may be accessing water from Lake Chelan to drop on spot fires in the Entiat Valley. Fire Officials report relief that the lightening event predicted for this afternoon is over without apparent incident. No lightening is currently forecast in the Entiat Valley tonight. With wind gusts in the 30 mph range, a fire spokesperson indicated “we are in for a firefight this evening and through the night.” However, he also indicated heavy air tankers are attacking the Cougar Creek Fire from the air and fire crews are working aggressively to strengthen firelines. There were spot fires on the west side of the Entiat River which required structure defense and protection, but no structures have been lost or damaged at this point. Winds are blowing smoke from the west/southwest into the Lake Chelan Valley. Air quality in Chelan was recently raised from unhealthy to hazardous, which means more healthy people are likely to have breathing problems. 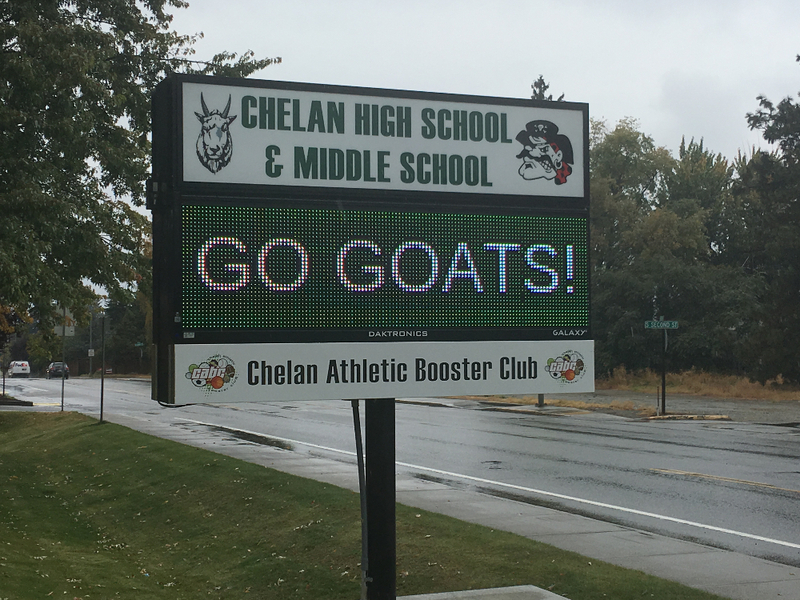 Chelan County Emergency Management recommends that people stay indoors, do only light activities, and keep windows closed if possible. N-95 Respirator masks are available at the Chelan & Manson Fire Departments, Chelan & Manson Post Offices, Chelan & Manson Public Libraries, Manson Chamber of Commerce and Chelan Valley Hope. 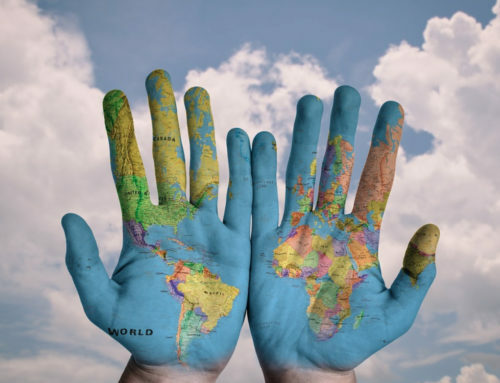 For updated air quality information, visit the Department of Ecology Air Monitoring Network website. Last evening forecasted winds out of the northwest arrived, pushing fire toward the southeast, down Miner’s Ridge, Hornet Creek and into the Mad River drainage. Wind-driven fire also moved through McKenzie Saddle with single-tree torching visible. Eastern lines on the Cougar Fire were tested, and in some areas, spot fires occurred, which are being managed today. Additional resources were acquired through State Mobilization for the Cougar Creek fire and activated last evening at 6:15 P.M. to assist the structure protection group in the Entiat River Valley. Structures were threatened during this wind event, but none were damaged or destroyed. Established fireline was effective in keeping the fire out of the Entiat Valley. Today’s priorities include securing the southeast of the fire in an effort to protect the Entiat River Valley. Additional priorities are the southwest portion of the fire from Sugar Loaf Lookout to the northwest and to the southeast. Firefighters will continue to extinguish spot fires caused by embers blowing across control lines from the fire’s push last evening. Strong winds from the northwest have pushed the Cougar Creek Fire to the southeast. The fire has crossed containment lines at McKenzie Saddle. Structure protection crews are in place, utilizing local, county, and state resources. The fire remains west of the Entiat River. 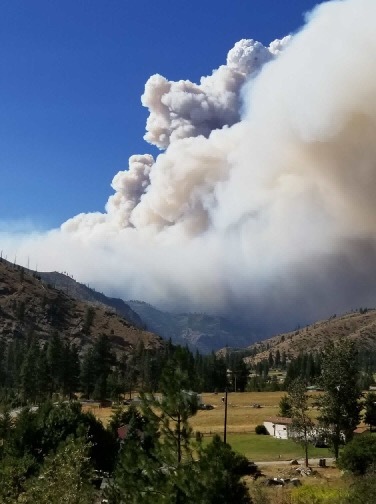 State fire assistance has been mobilized under the Washington State Fire Services Resource Mobilization Plan in support of local firefighters working to contain the Cougar Creek Fire, located in Chelan County, near the city of Entiat. Washington State Patrol Chief John Batiste authorized the mobilization of state firefighting resources on August 10, 2018, at 6:15 pm at the request of Chief Mike Asher, Chelan County Fire District 8. Mobilization specialists from the Fire Protection Bureau have ordered seven wildland strike teams. The fire will be managed by a Type 1 Incident Command Team. The State Emergency Operations Center at Camp Murray is activated to Level 2 to coordinate state assistance for the Cougar Creek Fire. State Fire Marshal’s Office personnel are en route to the scene to coordinate dispatch of resources. Changing fire conditions have now elevated the Ardenvoir area to a level 3 evacuation (LEAVE NOW). Entiat River Road from Crum Canyon to Ardenvoir is level 2. Entiat River Road from US 97-A to Crum Canyon is level 1. The Red Cross shelter is set up at the Warehouse Community Church – 14916 Hwy. 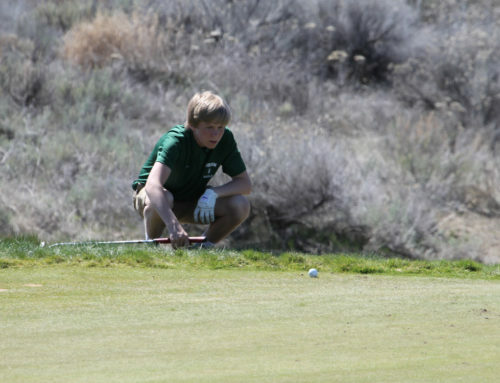 97-A in Entiat. Wenatchee Humane Society will assist with housing displaced animals from Level 3 residents. Entiat Fire Chief Mike Asher has requested mutual aid response from surrounding fire district, and created a staging area at Cooper’s Store in Ardenvoir. This is a precautionary procedure in the potential that weather conditions and anticipated lightening storms may cause movement in the Cougar Creek Fire. Fire officials indicate the fire has not come down the hill towards the Entiat River, but there is the potential, so structural engines, brush engines and tenders from Chelan #1 – Wenatchee, Chelan #3 – Leavenworth, Chelan #5 – Manson, Chelan #7 – Chelan, Chelan #8 – Entiat, Douglas #2 – East Wenatchee, and Douglas #4 – Orondo have been requested and are positioning in Ardenvoir. Currently, the previous evacuation levels remain in place. A Red Flag Warning forecasts shifting winds with gusts to 40 miles per hour Friday evening into Saturday. Windy conditions could cause fires to grow and spread rapidly despite fireline construction already completed. The forecast predicts an afternoon shift to strong northwest winds, which could align with ridges to push the fires to the southeast. Firefighters have used burnout tactics to help check the advance of flames in that direction. However dry vegetation, high temperatures, and low humidity mean airborne embers could ignite spot fires as much as a mile ahead of the main fire. The forecast also notes a possibility of thunderstorms without rain that could spark new fires in tinder-dry forests. Chelan County Emergency Management has raised existing evacuation levels and issued a new Level 1 Evacuation Notice at 7:00 pm tonight, Thursday, August 9, 2018. The National Weather Service has issued a Red Flag Warning until 11:00 am PDT Saturday morning for hot, dry and unstable conditions. A strong cold front will move into the area late Friday afternoon into Saturday morning bringing dry gusty winds and an overnight threat of thunderstorms with lightning but little rain. 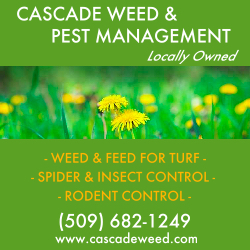 This combination results in critical fire weather conditions with the potential for increased fire spread of current fires and possible new fire starts. The Cougar Creek Fire, 20 miles northwest of Entiat, is 10,723 acres. A total of 895 personnel, including 22 crews, 6 aircraft, 28 engines, and 12 bulldozers are being shared between the Cougar Creek and Lost Fires. Chelan County Emergency Management has issued a Level 1 Evacuation Notice at noon today, Thursday, August 9, 2018. This means “time to prepare.” The area in the new notice includes the Mad River Road and the community of Ardenvoir. Persons are warned that current or projected threats from hazards associated with the approaching fire are now present. Very high temperatures and low humidity Wednesday led to increased fire activity on the southwest side. The fire crossed the Mad River north of Burgess Cabin between Alma and Wilma Creeks. Airtankers dropped retardant along six miles of ridgetops to slow the fire’s southwest spread. Burnout operations continued along the Tyee Ridge Road south of Tyee Lookout as fire crews worked to flank the fire and halt its spread to the east. The fire remained active overnight, as temperatures remained above 70 degrees with continued low humidity. Thursday, firefighters will conduct more burnout operations along the eastern side of the fire south of Tyee Ridge. Aircraft support will be available. On the west side of the fire, dozer operators will work to reopen a section of fireline first built during the 1994 Tyee Fire. A Red Flag Warning for hot, dry, windy conditions is in effect from noon to 11 p.m. Temperatures could top 100 degrees in the valley, with 78 to 83 degrees forecast on the ridgetops. Southwest winds 8 to15 miles per hour and gusts to 25 miles per hour are expected. Once again, residents should expect to see areas of smoke rising from the Cougar Creek and Lost fires during the afternoon and evening hours. Chelan County Emergency Management has raised the Evacuation Level to 3 as of noon today, Tuesday, August 7, 2018. This means “Leave Now.” The area is described as Potato Creek to the end of the Entiat River Road. Mad River to Potato Creek remains at a Level 2 for now. 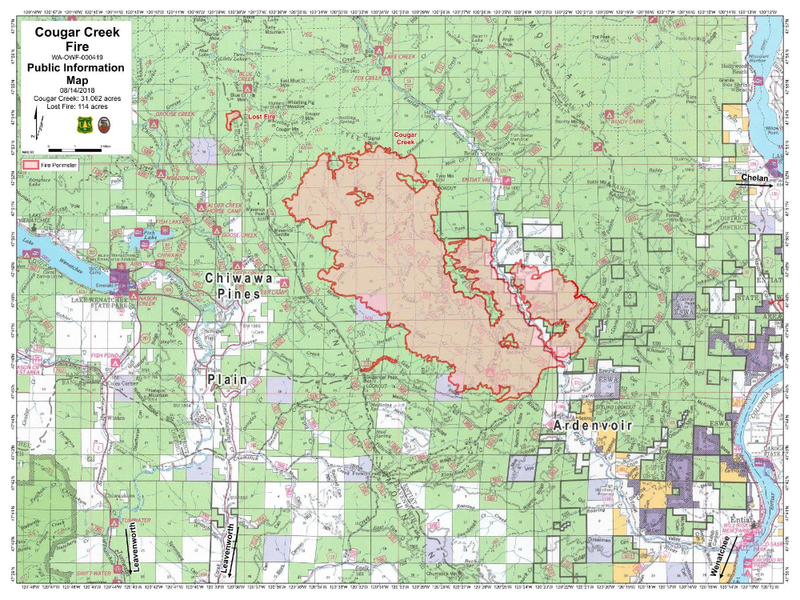 The Cougar Creek fire advanced to the head of Grandma Creek. The fire is established near the Tyee ridge and is visible from the Entiat Valley bottom. A new video of the fire is available on the Cougar Creek Fire Facebook page. Structure protection groups are in place along the Entiat River Road within the level 3 evacuation zone. 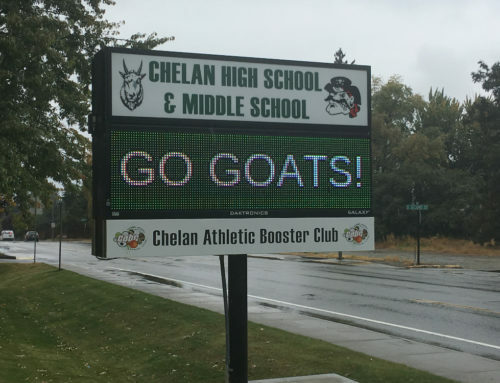 For specific questions regarding evacuations please call the Chelan County Emergency Management at 509-667-6863 . Red Cross can be contacted at 509-663-3907 for evacuation shelter information. For trailer Parking and Primitive Camping call Stucco by Alex, Inc. at 509-421-7999 . A community meeting was held last night at the Entiat fire station. Approximately 100 people were in attendance with another 108 streaming live on Facebook. Personnel from California Interagency Incident Management Team 5, Chelan County fire district no. 8, Department of Natural Resources, and the US Forest Service reported on the fire’s progress and answered questions. The Cougar Creek fire is active in thick dead and down timber. It is creeping and backing down steep rugged terrain. Although there was very little fire growth yesterday, the vegetation in the fire’s interior continues to burn. The north and west sides of the fire are relatively stable. The east side is holding west of Tyee Ridge. The spot fires on the east and south side are being worked so that existing roads and trails can be used to establish a continuous perimeter around the fire. Installing sprinklers and portable pumps in the Entiat Valley to protect residences. Reducing the fuel load by removing brush and dead timber using hand crews and heavy equipment, such as masticators, near residences in the Entiat Valley and Plain. Connecting containment lines using hand crews and dozers and old forest roads, keeping spot fires on the east and southeast section of the fire in check, (including putting a line around one). Using fire to burn vegetation along the south and southeast sections of the fire perimeter. Firing operations are an important tool in fire suppression because the main fire burns into the black, reducing its intensity. Although firing operations can generate additional smoke, it’s usually for a short duration. 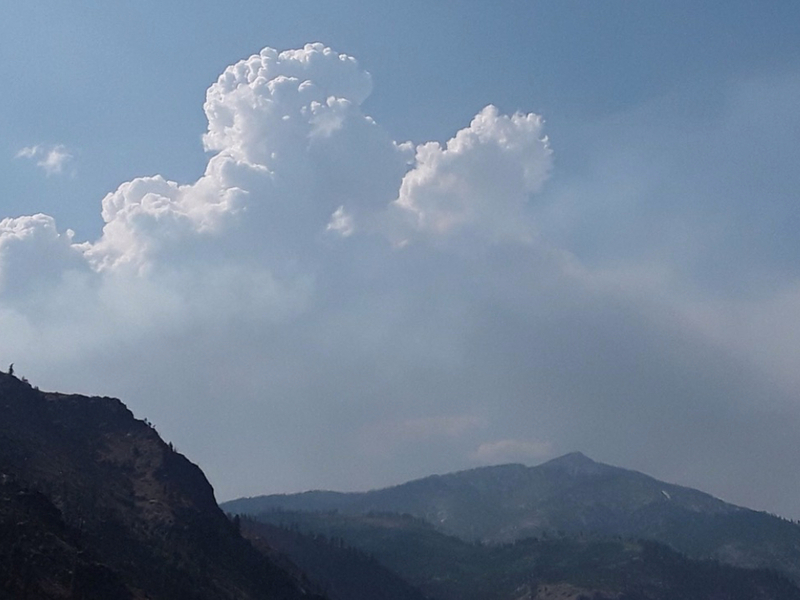 A new fire—called the Lost Fire—was reported yesterday afternoon four miles northwest of Maverick Peak and nine miles north of Plain. It is less than 50 acres and most likely started from lightening several days ago. Yesterday, firefighters conducted initial attack and air tankers dropped retardant around it. Today, sixteen smokejumpers will assess the fire, take suppression action if safe to do so, and provide intelligence to fire managers to develop a strategy. Firefighters and air operations will again take advantage of today’s weather to continue the progress made yesterday through a more aggressive attack on the fire. This is important because hot, dry and possible windy conditions are expected by the end of the week. There will be a public meeting Sunday at 6:00 p.m. at Entiat’s main fire station (2200 Entiat Way). Personnel from California Interagency Incident Management Team 5, the local fire department, and the US Forest Service will report on the fire’s progress and be available to answer questions. Last night engine crews patrolled the Entiat River Valley and monitored spot fires that got established west of Tyee Ridge on the fire’s eastern perimeter. Moderate growth occurred yesterday. Crews used heavy equipment to reopen the Tyee Lookout Road (Forest Road 5700) to gain better access to the spot fires on the eastern perimeter. Air operations dropped water on the spot fires near Tyee Lookout and in Young Creek. Pockets of unburned vegetation in the fire’s interior continue to burn, closing the gap in the fire’s perimeter. Today firefighters and air operations will attempt to suppress the spot fires south of the Tyee Lookout. Crews will continue to improve old fireline constructed during previous fires and connect them to existing roads and trails. On the southwest side, crews are identifying opportunities to increase defensible space around structures northeast of Plain. Structure-protection crews are also installing sprinklers systems around key locations. The California Interagency Incident Management Team 5 (Team 5) assumed command of the Cougar Creek Fire at 6:00 am, today. Fire behavior and spread was moderate Friday. Most of the growth was on the fire’s east side; however, it remains west of Tyee Ridge. A one-acre spot fire was detected on the east side of Tyee Lookout Road (FR 5700). Crews will attempt to access the spot fire and directly suppress it today. Unburned vegetation was consumed within the fire boundary and a large amount of dead and down timber from previous fires is the primary carrier. A night shift of engines patrolled the Entiat River Valley last night to watch for spot fires. The management priorities include protecting the Entiat River Valley, the community of Plain to the southwest, and the transmission power lines to the south. Isolated and group torching of snags and tree crowns should be expected today, particularly to the north and northeast side of the fire. Fire activity will spread primarily through the dead and down fuels. Thunderstorms are possible this afternoon, potentially bringing gusty, erratic winds. This type of weather can cause fire to quickly transition from the dead and down logs to the tree crowns. Team 5, Chelan County Fire Districts, mutual-aid departments, and the Chelan County Sheriff’s Office are working together to provide structure protection, including reducing fuel loads around structures. 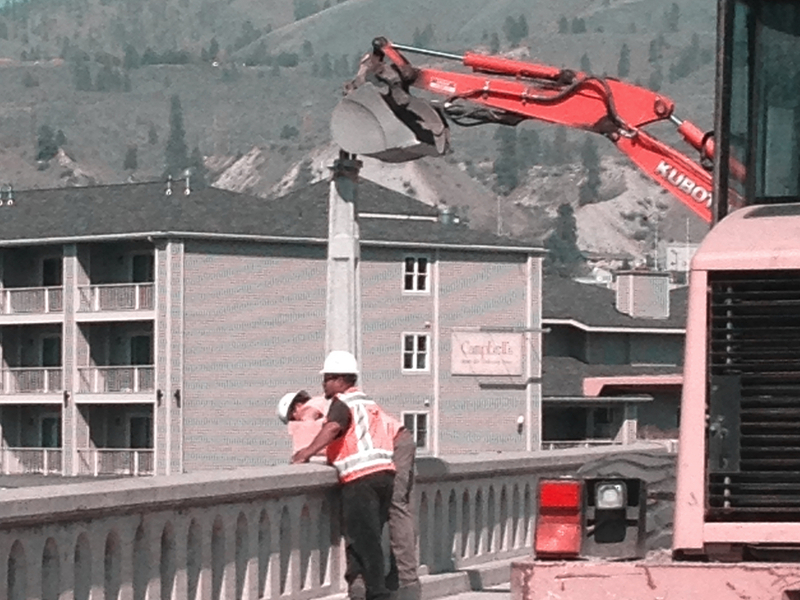 Structure-protection groups are in place along the Entiat River Road. High winds caused additional eastern fire growth yesterday. The fire reached a pre-identified management action point to initiate Level 3 evacuations. Evacuations were implemented in the the Upper Entiat River Valley from Potato Creek (~Miles Post 14) north. 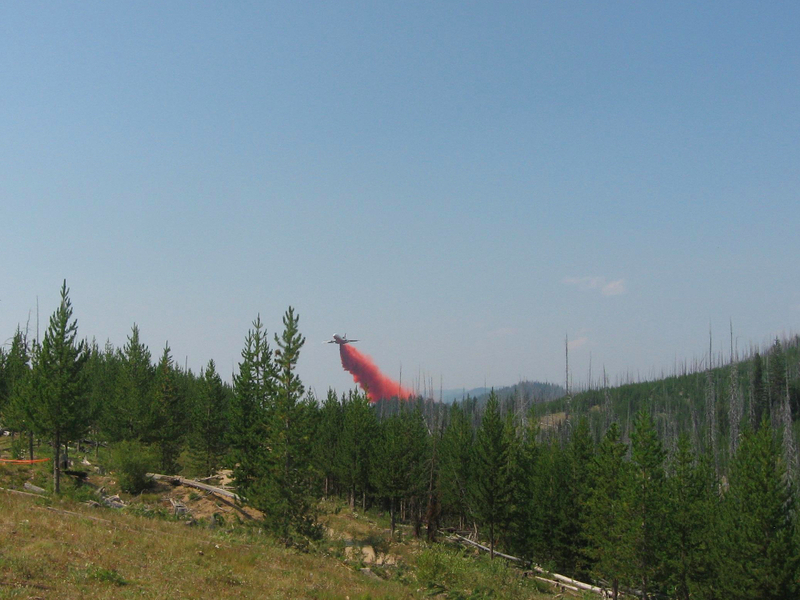 Over 43,000 gallons of fire retardant was dropped on the fire to slow progression along the southwest corner of the fire near the Mad River. Northwest Interagency Incident Management Team 11 (NWT11), Chelan County Fire Districts and mutual aid departments, and the Chelan County Sheriff’s Office are working together to provide structure protection. Structure protection groups are in place along the Entiat River Road within the Level 3 evacuation zone. Today begins the transition from NWT11 to a Type 1 team. California Interagency Incident Management Team 5 will assume command beginning tomorrow, 8/4/2018, at 6:00 am. Chelan County Emergency Management has raised the Evacuation Level to 3 as of 5:00pm. This means “Leave Now.” The area is described as Potato Creek to the end of the Entiat River Road. Mad River to Potato Creek remains at a Level 2 for now. Current Activity: The Cougar Creek fire had several spotfires that advanced ahead of the fire. Air attack flew over the fire to gather information. Due to heavy smoke, crews are having a hard time getting an accurate size and location of the fire. Northwest Interagency Incident Management Team 11 (NWT11), Chelan County Fire Districts and mutual aid departments, and the Chelan County Sheriff’s Office are working together to provide structure protection. Structure protection groups are in place along the Entiat River Road within the level 3 evacuation zone. Winds are expected to continue tomorrow with gusts up to 30 mph. The Red Cross has an evacuation shelter located at the Warehouse Community Church, 14916 Hwy 97A, Entiat, WA. For trailer Parking and Primitive Camping call Stucco by Alex, Inc. at 509-421-7999 . A temporary flight restriction (TFR) remains in place over the Cougar Creek fire area restricting public access for aircrafts including drones. The TFR was expanded due to heavy fire activity on the Cougar Creek fire. The public is reminded that when a drone is sighted within the TFR all air operations are grounded. Grounded air operations inhibits ability to conduct critical fire suppression efforts. Flying within the TFR is prohibited and against the law. Smoke: The Cougar Creek fire has a large visible smoke column that can be seen for miles. Smoke is filtering into surrounding communities, particularly Chelan. N95 masks are available at local fire stations provided by the Chelan County Sheriff’s Office For more information on smoke and public health, please visit: wasmoke.blogspot.com. Residents between Potato Creek to Mile Post 25 up the Entiat Valley have been elevated from Level 2 Evacuation (Get Ready) to Level 3 Evacuation (Leave NOW). Smoke continues to be a factor hindering firefighter operations. The Cougar Creek wildfire, located up the Entiat Valley, continued to grow over the past 24 hours. It is currently at 1,559 acres with 0% containment. NW Incident Command Public Information Office (PIO), Norma Brock, reports that the lightening-caused fire is moving in a south-eastern direction into the Billy Creek area at a rate of about 2 miles per day. She reported that firefighting efforts have been hampered because dense smoke prevents clear mapping as well as air support at this time. “There is no clear view of the fire and it’s not safe to fly,” she said. A community meeting was held last night at the Entiat Fire Station with approximately 100 people in attendance. NW Team 11 Incident Command, Entiat Fire Chief, Forest Service District Ranger, and NW Team 11 Fire Behavior Analyst each addressed attendees with updates, concerns and how best to prepare for the expected increase in fire behavior. During the meeting, Entiat Fire Chief Asher spoke to his friends and neighbors with “compassion” as he explained the current situation and the potential for this fire to continue to grow significantly. Evacuation notices increased from Level 1 to Level 2 at 2:00 PM yesterday based on increased fire activity and forecasted wind information for the incident. This Level 2 evacuation is for both sides of the Entiat River Road from Mad River Road to the end of the Entiat River Road, to include Mud Creek Road. Ardenvoir is currently not affected. Level 2 means to “Get Set”; be packed and prepared to evacuate in case a higher level of evacuation is issued. A Type 1 Incident Management Team is en-route and expected to arrive today to begin transition. The Type 1 Team will assume management of the incident in the next day or two. Fire Officials report the Cougar Creek wildfire located 20 miles northwest of Entiat has doubled in size to 803 acres. There is currently 0% containment according to PIO Norma Brock. Officials have scheduled a community information meeting on Wednesday (8/1/18) at 6 p.m. at the Entiat Fire Station #8. As of Tuesday, there was a level 1 Fire Advisory for both sides of the Entiat River Road from Mad River Road to the end of the Entiat River Road, to include Mud Creek Road. Ardenvoir is not affected. A temporary flight restriction (TFR) remains in place over the Cougar Creek fire area restricting public access for aircrafts including drones. The public is reminded that all air operations are grounded any time a drone is sighted with the TFR, which inhibits their ability to do critical fire suppression efforts. Flying with the TFR is prohibited and against the law. Smoke: A large smoke column from the Cougar Creek fire is visible from several communities in the area. Smoke may filter into surrounding communities. For more information on smoke and public health, please visit: wasmoke.blogspot.com.